Music and Seniors: These Benefits Will Have You Kicking Up Your Heels! These days, music is more available than ever before. For those who carry smartphones or tablets with them everywhere they go, hundreds of thousands – if not tens of millions of songs – are simply a couple of touches or finger swipes away. If you are a caregiver for an older person, your smartphone can become one of the most useful tools in your possession in helping connect music and seniors. This widely circulated video clip from the Alive Inside documentary demonstrates just how tremendously effective music can be for older adults with limited abilities and dementia. With vast musical libraries readily available from places like iTunes, Pandora, Rhapsody, Spotify, and countless others, we can now find music, in many instances for no cost, in a variety of styles in mere seconds. 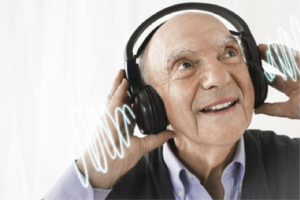 Caregivers can ask clients or family members what sorts of music the older person enjoyed during his or her lifetime. The music a senior could have appreciated might be specific to a certain period of time, like Big Band music, or it could be unique to his or her religious affiliations, such as gospel or hymns, for instance. The form of music enjoyed throughout one’s life can also hinge on the person’s ethnic background – like those who prefer reggae or salsa. The senior might also have enjoyed timeless favorites such as jazz, blues, classical, country, and so on. Regardless of the musical preference, availability to music could have powerful benefits. Have you ever listened to a song on the radio and it took you back to a specific time in your life? Studies have revealed that music is strongly linked to personal memories. The human brain is actually hard-wired to associate music with long-term memories. This is true even for individuals with moderate to severe dementia. Music & Memory is a non-profit organization that brings personalized music into the lives of older adults through digital music technology, immensely improving quality of life. The employees at Music & Memory train caregivers for the elderly and family members in how to develop and utilize individualized playlists with digital devices in order to allow those who have dementia and other challenges to reconnect with the world through memories from music. Studies have also revealed that hearing music that is familiar and well-loved can help in reducing anxiety levels and enhance focus on the present timeframe, which in turn helps the elderly with dementia connect to those around them. At Hired Hands Homecare of California, our intent is always to enhance the quality of life for the elderly through our specialized dementia home care services and support. And, we go the extra mile when it comes to the little things that can brighten up the days of those we serve – such as through connecting music and seniors. Contact us today at (866) 940-4343 to learn more.